Transland’s CP Products line is rolling out our new Air Stop valve. So innovative that a Patent is pending, the Air Stop valve uses the existing rig compressor but replaces traditional pinch valves to give the operator faster, positive shut-off, and easier maintenance. Air pressure for use need not be more than 20 – 40 psi higher than liquid pressure. 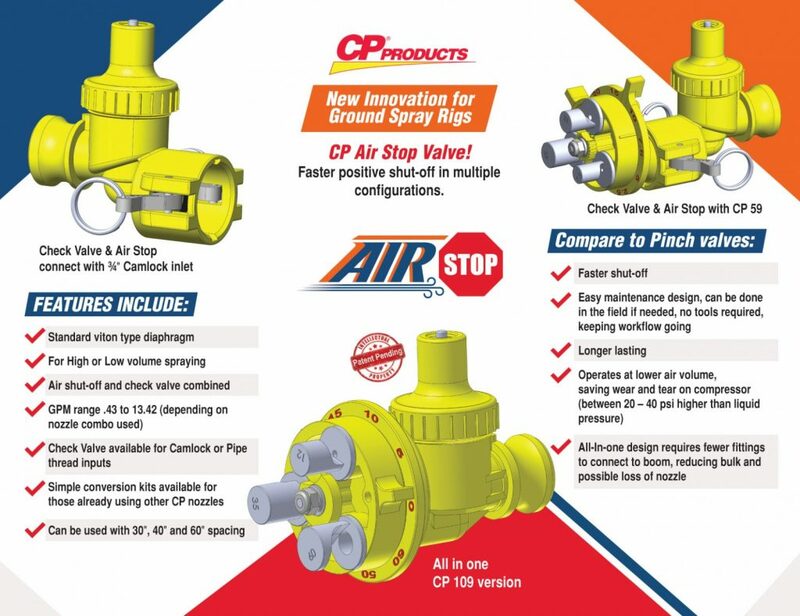 The CP Air Stop valve is actually a combined check valve and air shut off all in one, featuring a standard viton type diaphragm. The multiple combinations available make the CP Air Stop perfect for high or low volume spraying. The all in one unit, the CP-109LS/HV-AS reduces the bulk on the boom resulting in less strain on equipment. With a multi orifice selector plate and three deflection options, changes in the field are as easy as turning a dial. Call us to find out more at 866.303.0600, or see your CP Products Ground Spray Equipment dealer.